Size of this preview: 427 × 599 pixels. Other resolutions: 171 × 240 pixels | 1,419 × 1,991 pixels. 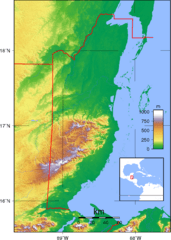 Description: Topographic map of Belize. Created with GMT from SRTM data.